Travelzoo, a global Internet company that publishes and promotes deals from more than 2,000 travel, entertainment and local businesses such as restaurants and spas, self-reports it remains the only U.S. listed company with a board of directors that is 80% women. That number is remarkable enough on its own but note that Travelzoo has seen its share price increase by 54% under the leadership of this nearly all-female board. The uncommon candor exemplified by Travelzoo is not just the recognition and validation of the tremendous power of female leadership, although that’s pretty awesome. The candor is also an organization that knows its consumer base and has put in place a board of directors who are a direct reflection of that market. The Travelzoo board exhibits cultural diversity with members from San Francisco, New York, London and Shanghai to reflect the company’s 28 million members across North America, Europe, and Asia Pacific, and its 25 offices worldwide. 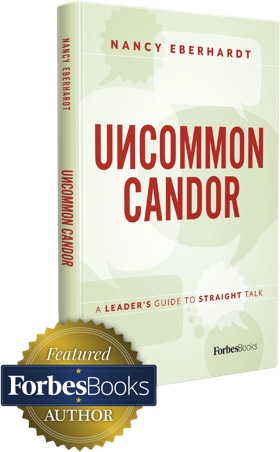 Candor is honest, direct and respectful leadership. Travelzoo has nailed it.